The Lady Katherine necklace features a large pear drop "mother of pearl" coloured Coober Peddy Australian Opal with a unique vein pattern. This unusual Opal has some bright green, blue, yellow and orange flashes appearing in places between the vein of the stone. 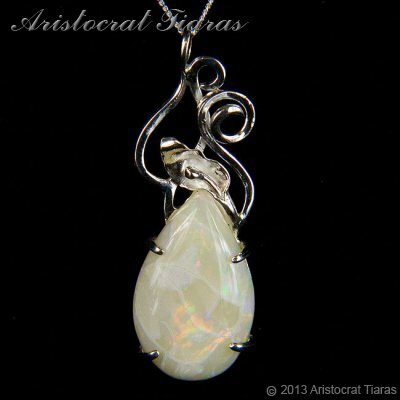 The Opal is set in an elegant and decorative handmade sterling silver design with a silver leaf. This attractive necklace from Aristocrat Tiaras is part of our Opal jewellery collection for one special mother of the bride or lady to enhance her outfit or makes a great gift for any special occasion! Please note: This Coober Peddy Opal is one off gemstone and is unique, the pendant shown is the actual item for sale and the gemstone can not be duplicated.